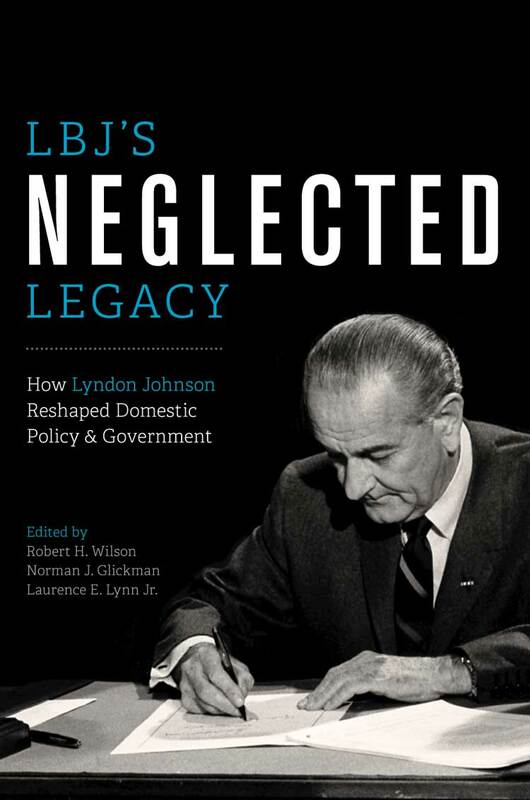 LBJ’s Neglected Legacy How Lyndon Johnson Reshaped Domestic Policy and Government Edited by Robert H. Wilson, Norman J. Glickman, and Laurence E. Lynn, Jr. Leading experts from many disciplines investigate the extraordinary range and extent of LBJ’s influence on American public policy and administration, a legacy that makes him one of America’s most effective, if controversial, leaders. During the five full years of his presidency (1964–1968), Lyndon Johnson initiated a breathtaking array of domestic policies and programs, including such landmarks as the Civil Rights Act, Head Start, Food Stamps, Medicare and Medicaid, the Immigration Reform Act, the Water Quality Act, the Voting Rights Act, Social Security reform, and Fair Housing. These and other “Great Society” programs reformed the federal government, reshaped intergovernmental relations, extended the federal government’s role into new public policy arenas, and redefined federally protected rights of individuals to engage in the public sphere. Indeed, to a remarkable but largely unnoticed degree,Johnson’s domestic agenda continues to shape and influence current debates on major issues such as immigration, health care, higher education funding, voting rights, and clean water, even though many of his specific policies and programs have been modified or, in some cases, dismantled since his presidency. LBJ’s Neglected Legacy examines the domestic policy achievements of one of America’s most effective, albeit controversial, leaders. Leading contributors from the fields of history, public administration, economics, environmental engineering, sociology, and urban planning examine twelve of LBJ’s key domestic accomplishments in the areas of citizenship and immigration, social and economic policy, science and technology, and public management. Their findings illustrate the enduring legacy of Johnson’s determination and skill in taking advantage of overwhelming political support in the early years of his presidency to push through an extremely ambitious and innovative legislative agenda, and emphasize the extraordinary range and extent of LBJ’s influence on American public policy and administration. Robert H. Wilson is the Mike Hogg Professor of Urban Policy at the LBJ School of Public Affairs at the University of Texas at Austin, where he served as Associate Dean for Academic Affairs and Research. Norman J. Glickman is Distinguished University Professor of Public Policy and Urban Planning at Rutgers University. He formerly served as the Director of Rutgers Center for Urban Policy Research. Laurence E. Lynn, Jr., is the Sydney Stein, Jr., Professor of Public Management Emeritus at the University of Chicago. He served as Deputy Assistant Secretary of Defense during the Johnson presidency. The centennial anniversary of the birth of Lyndon B. Johnson and the ﬁf- tieth anniversaries of his signal legislative achievements—the Civil Rights Act, Voting Rights Act, and Economic Opportunity Act—have combined to stimulate renewed interest in the legacies of his extraordinary and con- troversial presidency. During and following LBJ’s years in oﬃce, signiﬁcant literatures have explored the social, political, and economic consequences not only of those historic enactments but also of his strategies for the war in Vietnam. Because he was viewed as a larger-than-life political leader, much has been written as well about Lyndon Johnson the man and his consequen- tial life and political career. But there is more to the story. Johnson’s legislative achievements reﬂected his ambition to transform the federal government into an institution that could fulﬁll the liberal prom- ise of Franklin D. Roosevelt’s New Deal, Harry S. Truman’s Fair Deal, and John F. Kennedy’s New Frontier. Johnson’s Great Society encompassed a wide range of domestic policy initiatives, and many have been studied in depth—the Elementary and Secondary Education Act, Medicare and Medicaid, and the Community Action Program—but the longer-term im- pact of his presidency on American politics and governmental institutions has received less scholarly attention. Perhaps appropriately for a president of bold political ambitions and con- summate political skill, the polarized politics of the twenty-ﬁrst century’s second decade gave rise to the war cry of conservative critics: America’s lib- eral government is LBJ’s fault. The nation’s conﬂicted politics coincided with scholarly interest in sober appraisals of what we term in this volume as Johnson’s “neglected political and institutional legacy”: the transformation of the American administrative state. The remarkable Civil Rights Sympo- sium held at the Lyndon B. Johnson Presidential Library and Museum in April 2014, with the participation of three former presidents and the then- sitting president, provided additional evidence of the renewed attention be- ing given to LBJ’s policies and their long-term eﬀects. The genesis of the present volume occurred in the fall of 2008 when the Lyndon B. Johnson School of Public Aﬀairs at the University of Texas at Austin organized a commemoration of the centennial of LBJ’s birth. That symposium assessed domestic policy legacies for contemporary public policy and administration and for the newly elected president, Barack Obama. The symposium attracted considerable attention, which inspired its organizers to identify a signiﬁcant lacuna in the scholarship concerned with Lyndon Johnson’s presidency and its consequences for America. Soon after LBJ left oﬃce, there appeared signiﬁcant studies on many policy initiatives, a num- ber of which have been subject to persistent analysis over the decades, such as civil rights, voting rights, and poverty. But rarely has analysis dealt with the still-unfolding consequences of the bulk of LBJ’s original legislative ini- tiatives. Moreover, no one has comprehensively analyzed the impacts of these initiatives on policy and the administrative state. The intellectual excitement generated at the centennial symposium at the LBJ School led its organizers to enlarge the project to a volume of presiden- tial scholarship. We commissioned thirteen papers covering some of the do- mestic policy areas that most concerned President Johnson, although not addressing the full range of his legislative achievement. The authors come from wide-ranging ﬁelds, including public policy and management, eco- nomics, political science, sociology, history, environmental engineering, and urban planning. We believe the result of the eﬀort advances the under- standing of an important but heretofore neglected legacy. "An important compendium of current scholarship on the successes and limitations of the most monumental domestic program in U.S. history."